The NFL action at Wembley has once again been capturing the imagination of the British public, while millions tune in back in the States to watch their heroes strut their stuff across the pond. 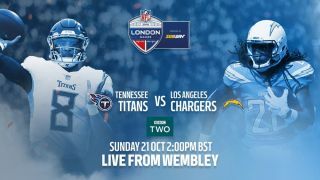 Next up in London is Los Angeles Chargers vs Tennessee Titans – don't miss out. It's live for free on the BBC and you can watch it from anywhere. The impressive 90,000-seater Wembley Stadium in West London will host the Los Angeles Chargers vs Tennessee Titans battle. It's been the home to a few NFL games a season for a few years now. The game starts at 2.30pm BST local time, which means 9.30am ET and an early 6.30am PT. The NFL roadshow is rolling back into London's Wembley stadium and with American Football continuing its rise in prominence in the UK and beyond, you can grab a live stream of the next big overseas tie – Los Angeles Chargers vs Tennessee Titans – by following this guide. Neither of these sides has ever won the Super Bowl, but the Chargers have shown good promise in recent weeks and enter the Wembley contest on a three-match winning streak. One of the stars of the show on Sunday could well be in-form running back Melvin Gordon, who recorded three touch downs just last week against Cleveland Browns. For the Titans, this will be their first ever appearance in London. Having lost 21-0 to Baltimore Ravens last week, the Tennessee outfit will need a big improvement in all areas if they're to match the Chargers. Simply open the VPN app, hit 'choose location' and select a UK location - it doesn't matter which one and it's super easy to do. The reason to choose the UK? Because it's being broadcast live for free, so as soon as you have a UK IP address you're free to watch Chargers vs Titans hassle free. TVPlayer is a free online streaming service which offers hundreds of channels - and you don't even need to sign in. Among the channels on offer is BBC Two which will show the entire event live. And the best bit? The BBC doesn't have commercials so you'll be able to enjoy totally uninterrupted coverage without a single commercial break. Want to record the NFL and watch it later? TVPlayer will also allow you to do that too. You'll need to sign up for a paid account, but the good news there is that the site offers a 14-day free trial so no payments required! Which countries can I watch Chargers vs Titans from using a VPN? A VPN will enable you to watch the NFL from literally anywhere. So that obviously includes: US, UK, Israel, Belgium, Canada, Germany, Denmark, India, Netherlands, Spain, Brazil, Belgium, Romania, Mexico, France, Sweden, Italy, Portugal, Czech Republic, Ireland, Poland, Kenya, Hungary, South Africa, Indonesia, China, Nigeria, Bangladesh, Russia, Japan, Egypt and more! DirecTV Now $50 per month - DirecTV Now includes CBS, Fox, NBC, ESPN and for $5 extra you can add the NFL Network. However, with this service you can only watch football on local TV stations live. Sling TV $40 per month - Sling TV splits its live NFL options across its $25 a month Blue plan and $25 a month Orange plan. By combining the two, you get a $10 dollar discount and access to Fox, NBC, ESPN and the NFL Network. Although Sling TV does not offer CBS which could be important to you if you want to watch AFC games on Sunday afternoons. Hulu with Live TV $40 per month - Hulu with Live TV includes CBS, Fox, NBC and ESPN but does not come with NFL Network. YouTubeTV $40 per month - YouTubeTV gives you access to CBS, Fox, NBC and ESPN but just like with Hulu with Live TV, there is no NFL Network. Amazon Prime $119 per year - Amazon’s streaming service will stream 11 Thursday Night football games this season that will be simulcast on Fox. However, these games will also be shown on Twitch which means that you can watch them online for free without having to sign up for Amazon Prime. And if you're out of the US and want to tune in still, then you can use a VPN to get around any geo-restrictions in play.